... is scheduled as the guest speaker for the 183rd meeting of the Karl Hess Club, to convene on September 21, 2009. Ed Bowers on "Dollar Cost Averaging, or How to Predict the Future for Fun and Profit." Last September, on the eve of Options Expiration Friday, Ben Bernanke, Hank Paulson, and George W. Bush pulled their anti-free market stunt when their irresponsible actions could most violently and arbitrarily determine who would be a winner and who would be a loser that day. No sour grapes for Ed, who cleared a whopping ten bucks that day, and positioned himself to profit from the precipitous market decline to follow. As the co-author of Oliver Stone's Wall Street, Stanley Weiser, wrote to the L.A. Times, admonishing us that "Greed is not Good," the government manipulated the markets in ways that fictional bad guy Gordon Gekko never did even in his wildest dreams. It's said that "Capitalists may not take an interest in politics, but that doesn't mean politics won't take an interest in your capital." And you may have no interest in the market, but it has one in you. Can you profit from bailouts if you aren't the one getting bailed out? Are there lessons to be learned for libertarians here? Bowers has some for you. Ed Bowers was introduced to the concept of dollar cost averaging in 1995 when he began investing in a mutual fund that focused on gold and mining. Automatically contributing $50 a month, Ed watched the share price rise and got the feeling it was time to sell half of his position. He didn't. Missing his chance at early profits, Ed looked at some historical charts and decided it might take six years to recover, but he would continue to dollar cost average -- keep buying a set dollar amount's worth on a regular basis -- into the fund. Gold began its comeback in 2002, though it took longer for Ed's share prices to return to what one might term "close enough for government work." Ed's first stock pick was 20th Century Fox. Still in high school and with little money, he did not buy, despite an adventuresome friend who got them as far as a broker's office. In less than a year it nearly doubled in price, when Fox was bought by Marvin Davis. Sticking with movies, five years later, Ed bought his first 100 shares of stock (MGM). Disclaimer: Ed Bowers is not offering any financial advisor services. Invest at your own risk. 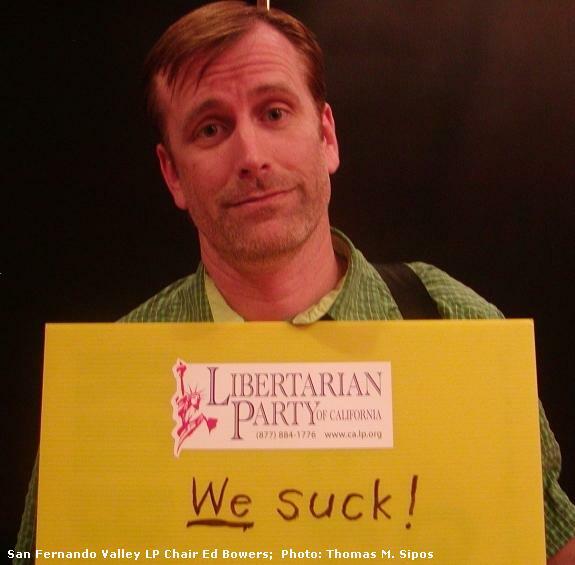 Ed Bowers has been Chair of the Libertarian Party of San Fernando Valley since 2003. Above, Ed expresses his disappointment with the newly nominated Barr/Root ticket, at the 2008 LP national convention in Denver. He insisted I take this photo, and asked that I print it in California Freedom. I figured that would freak out the LPC's hypersensitive officials. Instead, I printed it on my blog. -- Thomas M. Sipos.